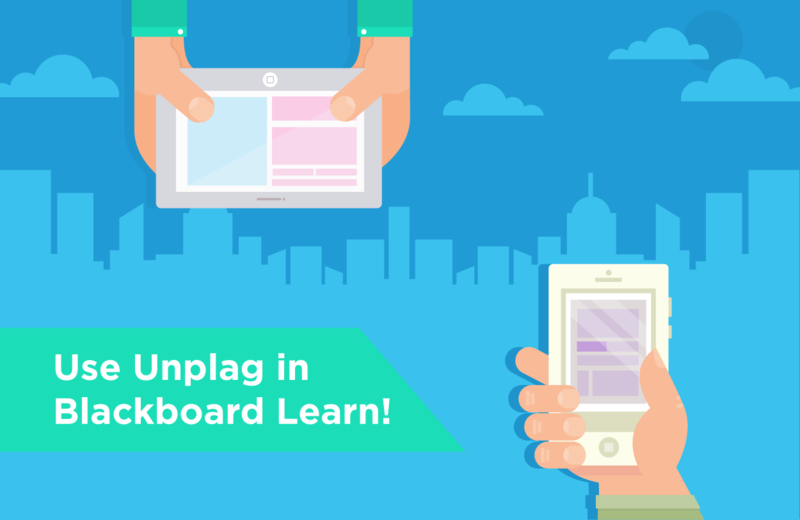 Good news for all educators using Blackboard Learn™. The Unicheck plagiarism checker has recently become available for use within Blackboard Learn courses. So, if you are a fan of integrated tools within Blackboard Learn, it’s high time to register an account at unicheck.com and see it in action. It can be done either on one’s own or under the supervision of the Unicheck team. Once the registration is completed, you’ll get access to the institution account at unicheck.com. To activate the LTI app in Blackboard Learn, your LMS administrator should obtain the API key and secret (which can be found in the API Settings section of your Unicheck account) and make initial setup. That’s all you need to get started. 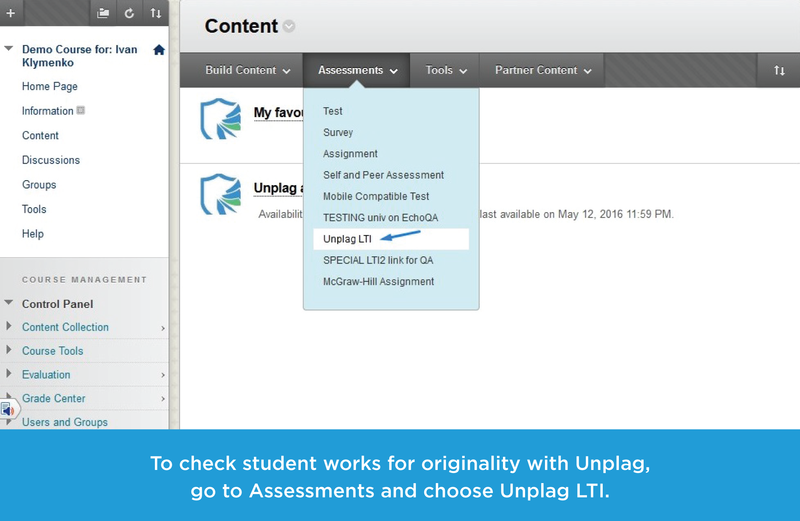 Now, educators can create assignments by choosing Unplag LTI as it is demonstrated on the screenshot below. The account authorization is performed automatically. In other words, there’s no need to administer accounts and bother about user access permissions. The next step is to adjust assignment settings. They may be different for each activity depending on the goals a professor or teacher pursues. It’s possible to choose one out of three types of similarity checks (against the Internet, all files in the university account, or both the Internet and all the files in the university account) and exclude citations and references from the report. Unicheck identifies the most popular academic writing formats, e.g. : APA, MLA, Chicago, Turabian, and Harvard. When omitted, the system won’t consider accurately cited material as plagiarism. This way, educators can receive more precise similarity percentage. Additionally, educators may let students run a certain number of pre-checks before submitting their writings. To leave out minor similarities such as introductory words or commonly repeated idioms, and obtain more relevant check results, instructors can adjust search sensitivity settings. To view assignments, students should select Content in the Blackboard Learn menu. The moment assignments are ready for submission, students upload and submit them. 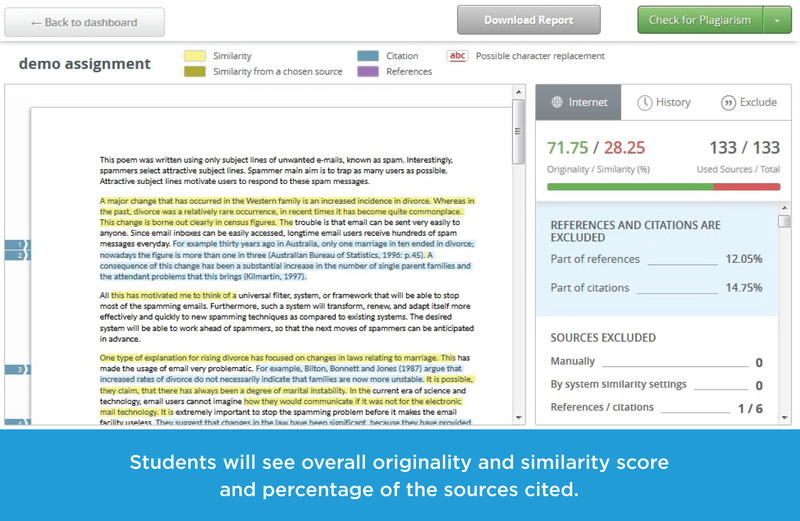 Right after instructors check writings for similarities, students can view grades they received (if educators chose to evaluate them) as well as interactive plagiarism reports, click links leading to original sources and see highlighted unoriginal sentences. All reports are also available for download in .pdf. If educators enable the Draft Check option, students will get access to the Draft folder and will be able to scan their papers to ensure there aren’t any uncited sources left. 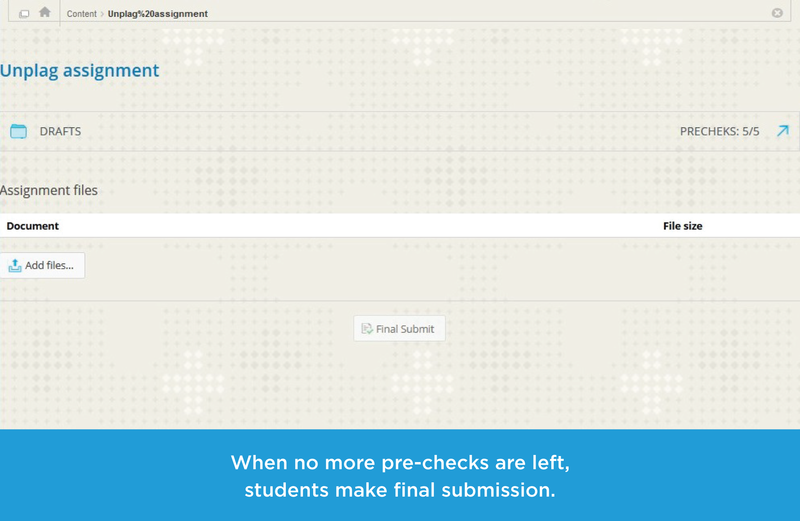 Draft check results always remain accessible only for students. The moment students submit papers, Unicheck scans them for similarities and returns originality rate as well as a link to the report. To start working with it, it’s necessary to click the document icon or the row with assignment details. 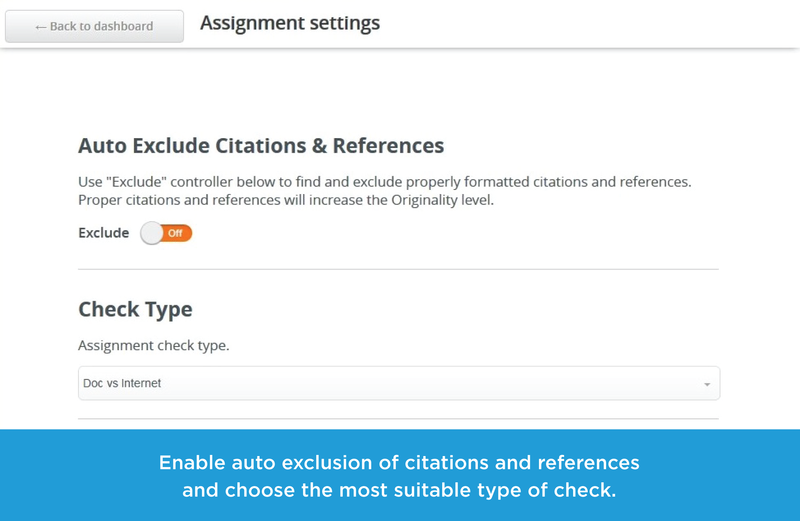 Here, an educator can omit citations and references, open plagiarized sources, see replaced characters (if there are any), or download the report. Percentage of similarities is also shown next to each original source. An instructor can easily omit a particular source by clicking the cross icon. All omitted sources will be then included into a separate report section. Students view reports and grades. Please also note, the Unicheck functionality updates become accessible to all registered users right after they are released at no extra cost. Stay tuned to be aware of the new Unicheck updates the moment they are released! Wishing you plagiarism free papers! Olympic Games in Rio 2016: Learn Where the U.S. Athletes Studied!